Hello, I'm so glad you stopped by! I'm excited to be joining my blog friends for some farmhouse inspiration! This is our second Best of Farmhouse Friends. What does farmhouse style mean to you? For me, it means warmth, coziness, and simplicity. Even though I don't live on acres of land, own chickens and cows or have a large front porch, I can still get the warmth, coziness and the simplicity of a farmhouse home. Here are a few details that I use in my home. Mix different types of textures, like baskets, wood, and metal. In this small area near our front door, I used a picnic basket to hide flip flops and a metal clam basket to hold seashells. Woven hats and a large tote are hung from a repurposed window. I plucked these right out of the ground and used them in creative ways to decorate a barn wood cupboard and window box. Wood planks were installed to the small area above the mantel. 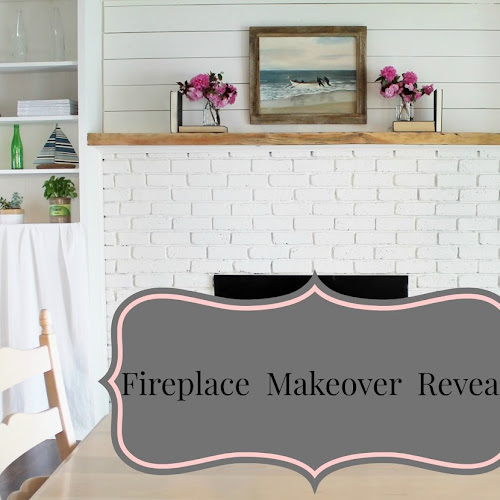 The entire fireplace was painted white to brighten up the room. Don't be afraid to embrace wood. I sanded the mantel to expose the raw wood. The scuffs and scrapes add farmhouse character. One of the reasons why I love farmhouse style so much is...... it's not fussy. I Mixed and matched fabrics for a comfortable, eclectic feel and kept the styling simple. I keep my shelves light and airy, by using a collection of bottles and magazines. I added fabric to the bottom shelf for a classic farmhouse style. I hope I inspired you to add farmhouse style to your home! 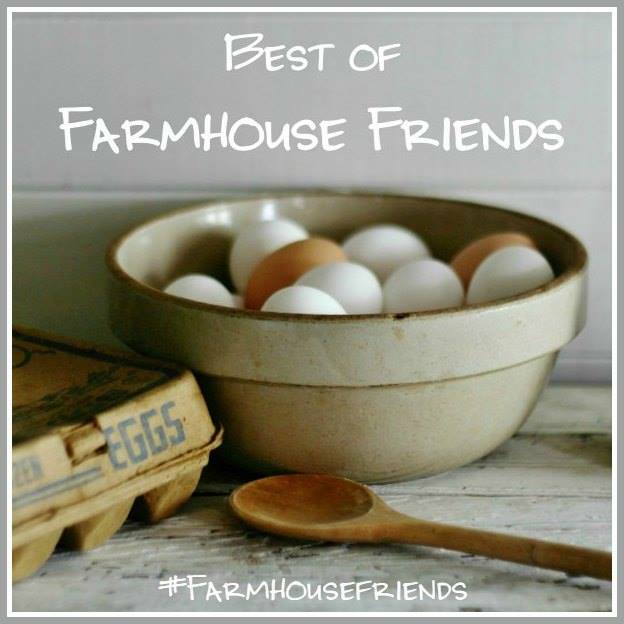 Now let's see what the rest of our Best of Farmhouse Friends Team has come up with! Click their names or photos below to see each blogger's project! Angie @ Knick of Time . Wonderful farmhouse ideas, Julie! Love the simplicity and relaxed looks you were suggesting! Your home looks so bright and pretty and I love all of your ideas to add farmhouse style. Your home is so warm and welcoming!Love the little vases with the numbers! Love all the detail you have brought into your home creating the perfect farmhouse style...so cute! Love those wildflowers! We just planted a wildflower garden and I can't wait until they bloom & we can bring them inside. Love those beautiful vases you have yours in! Flowers really do make a home so comforting! I love farmhouse style, and that houndstooth chair has me quite jealous.